I’m using The Wildwood app whilst I am away from my usual working environment, which is nice as I always have the deck and book with me. The quick paragraphs with the card in the app suggest that this card is a celebration within a communal group or family, the welcoming of new life or good fortune and perhaps the successful return after migration or travel by a tribe or grouping. Basically, it’s a card about celebrating togetherness, whatever the reason, whomever the “family” group is made up from, be it family, close friends or work colleagues you really get along with. I am aware that SF BATS Conference is taking place right now (San Francisco Bay Area Tarot Symposium) and it’s one event I’d love to attend: but perhaps in a few years I’ll be able to: being pregnant and with two children already does restrict the funds and time quite a bit! But I hope to make it by the time I reach 40. However, what does this say to you today? I see the coming together of friends, I see the celebration and joy in just being together, having fun, relaxing, but do you see anything else? I also see emotional fulfilment, connection and partnerships, emotional engagement and joy. 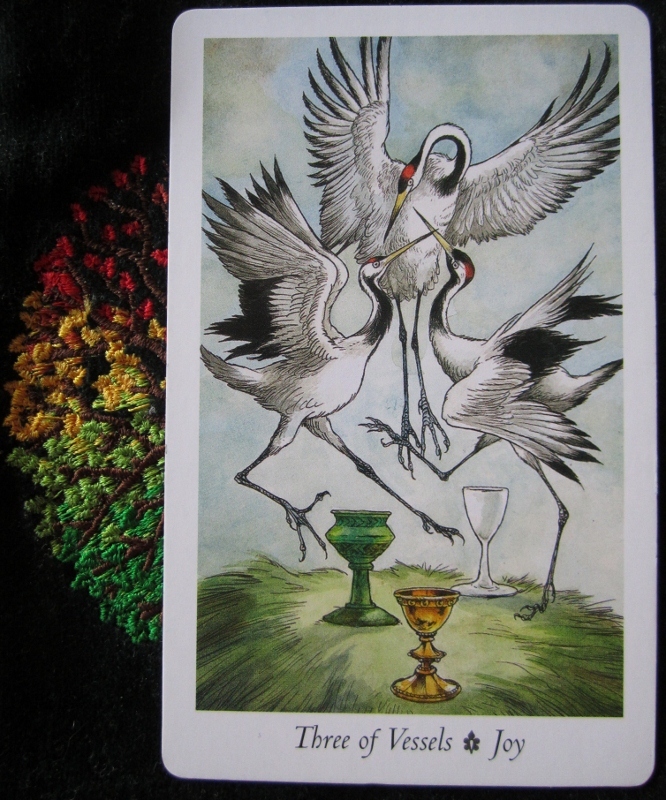 That’s quite a lot for three herons dancing around three different coloured cups! I am still sticking with the “don’t worry, be happy” theme and wherever you are, enjoy! This card just made me think of babies and the fact that you have the third one “in the oven”! Would love to come help! Any excuse to visit Britain. Alas, not a practical option. It’s so interesting to watch you young ones in the midst of child rearing when I’m 55 and my youngest is at university. I feel old, but strangely free. 😉 It’s all worth it, though, the child caring thing. Alison Cross had wonderful photos of her lovely son going back to school. It’s nice to see more of you all than just the Tarot part. So, what color schemes are you thinking of for the nursery?